If you are asking me how to find peace of mind, I would say to you: Let God find you. After all you're not the only one searching. You're searching for God, that's true, but God is searching for you. That is also true. [T]he life you seek is not in knowing but in being known, not in seeking but in being sought, not in finding but in being found." --Dr. Fred Craddock (1928-2015) Minister, Professor and Author (From his sermon, "Seek and You Shall be Found"). I never met him. Never attended his church in Georgia, but I've been profoundly influenced by his work. Hardly a week goes by that a story or a lesson from him isn't called to mind. When I go for long drives, I often will listen to a sermon or two of his. Dr. Fred Craddock has influenced two generations of Christian ministers with his work and writings, and will no doubt continue to do so for years to come. His books on preaching remain required reading in seminaries. He didn't fill stadiums or have prime time TV specials or meetings with heads of state. He didn't lead a mega church or a worldwide movement. He preached. He taught. He wrote. Though only 5'5", he was a giant. The power of his influence was in his quiet example, his humble living, his serious scholarship and in his powerful stories. His sermons were profound and simple, eloquent and folksy, hilarious and touching. You'd be hard pressed to find any sermon of his that followed the typical 'three point' sermon. No, he respected his audience and his craft more than that. His sermons pulled you in, and made you wrestle with faith and scripture. His most effective method was to tell stories. Funny stories, serious stories, sometimes strange stories. People will forget the bullet points, but tell them a story and now your message has a handle that people can grab hold of and carry with them. You didn't get a lot of 'The five steps to effective ministry or to a successful marriage or to find happiness.' The advice and admonition were there, but he didn't brow beat or bible thump. It wasn't a laundry list of imperatives, oughts, musts and shoulds. Weaving scripture and story, Craddock led his listener to the edge of conclusion, but didn't force it. He trusted that his listener would reflect, wrestle and make application, and that in that space, the Holy Spirit would work and speak and intercede. The next video is a good demonstration of how he could take a seemingly boring list of names from scripture (Romans 16) and bring it to life. Here's another one, delivered late in his life in 2011, in which he gives advice on sharing one's faith, "Tell It". Here's one even more recent, a reflection on "The God of Hope." Finally, here's a wonderful article written about Dr. Craddock soon after his retirement from full time preaching in October of 2011. Rest in peace, Dr. Craddock. You will be missed. 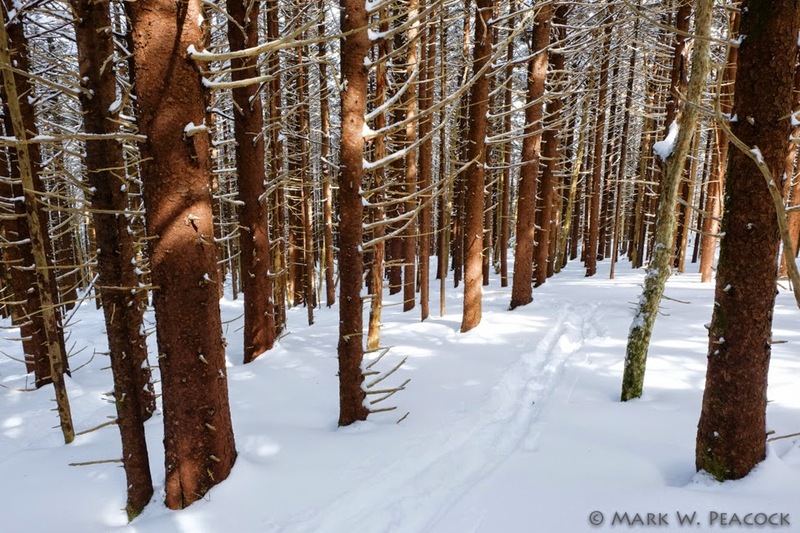 Photo Above: The Appalachian Trail on Roan Mountain after a snow. Thank you for your reflection on the faithful ministry of Fred Craddock. Like you, I never met him, but his teaching and preaching inspired me in ways that are impossible to calculate. Again, thank you for these words.